Russia manipulates a one-on-one meeting between Donald Trump and Vladimir Putin to push its foreign policy and operations through declaration of “agreements” between the two men. No officials were present when Trump met Putin for more than two hours in Helsinki, Finland on Monday — so no American other than Trump can challenge the Russian presentation of the encounter. Moscow said “formal agreements” had been reached on military matters, surprising the Pentagon, then declared that Trump was receptive to a proposal for a “referendum” entrenching Russia’s 2014 annexation of Crimea from Ukraine. On Friday, the Russian declared proposals for joint US-Russia efforts to fund reconstruction of Syria, easing pressure on the Assad regime propped up by Moscow. The Russian Ambassador to the US, Anatoly Antonov, said that Syria was a primary topic of the meeting and declared “the removal of the concerns that the United States has regarding the well-known claims about alleged interference in the [2016 US] elections”. 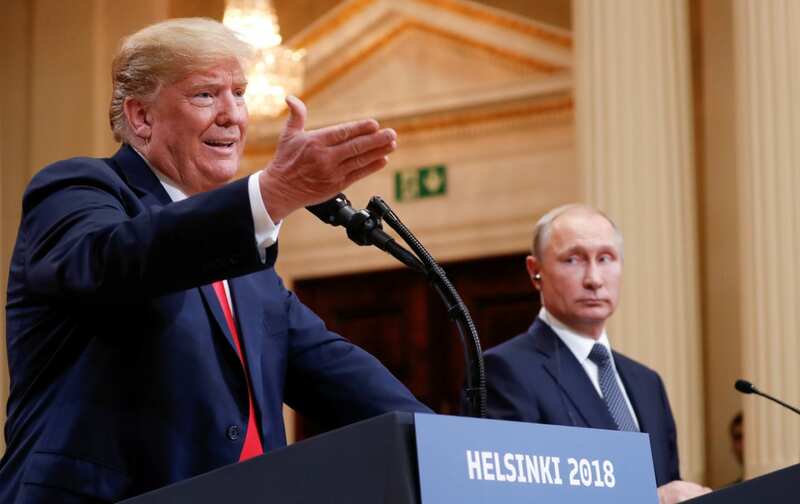 Antonov’s comment reflected Trump’s preference for Putin over US intelligence agencies over the Russian interference, set out in the US President’s comments at the Monday press conference. Under pressure, Trump subsequently made half-hearted, stumbling efforts to alter the remarks, but he tried to regain the initiative on Thursday with the sudden announcement of an invitation to Putin to visit the White House this fall. Several senior national security officials, including Director of National Intelligence Dan Coats, have not yet been briefed on the Helsinki Summit. Defense Secretary Jim Mattis met Trump on Thursday, but other top military officials are still expecting a readout from Trump or National Security Advisor John Bolton next week. As President Trump stated, the two sides agreed that their national security council staffs will follow up on the presidents’ meetings, and these discussions are underway. There were no commitments to undertake any concrete action, beyond agreement that both sides should continue discussions. The spokesman said the NSC and Russian counterparts are “continuing a working-level dialogue” to review suggestions by Putin for a new “cyber-group” — despite Moscow’s cyber-operations interfering in the US elections and in other countries — and “restarting a counter-terrorism group”. The two leaders also discussed forming groups of businesspeople and of retired diplomatic and military officials to provide ideas for cooperation,. Secretary of State Mike Pompeo, said “there was a discussion between President Trump and President Putin about the resolution in Syria and how we might get the refugees back”, but he did not provide details. The Pentagon said it is providing $200 million in assistance to Ukraine to help fight the Russian-back separatists in the east the country. Senate Republicans have dropped the effort to reimpose US sanctions on the Chinese telecommunications giant ZTE, after they were withdrawn by Donald Trump. The US Government had banned ZTE from access to American components for seven years after the company admitted that it sold goods to Iran in violation of US sanctions. But Trump intervened after ZTE, China’s second-largest maker of mobile phone handsets, said it would be put out of business with 75,000 jobs lost. lawmakers said Friday, a victory for President Trump as congressional Republicans abandoned a rare effort to thwart his agenda. Senators had vowed to put the reimposition in a defense. But the version from the House of Republicans did not have the provision, and senators agreed to leave out the clause in the final compromise bill. The House language bars US government agencies and contractors from doing business with ZTE, but allows the company to continue doing business with private American firms. Trump’s lifting of ZTE’s punishment runs counter to his general hardline approach to trade with China. The Administration has imposed tariffs on $50 billion of goods and is threatening duties on another $400 billion. Speculation on Trump’s action range from an appeal by Chinese leader Xi Jinping to the Chinese Government’s loan for Trump Organization project in Indonesia to Beijing’s approval of licenses for the clothing and accessory lines of Trump’s daughter Ivanka. More than 1,300 immigrant children are still separated from their parents, despite a court order for reunions by Julky 26. About 2,800 children were seized and detained, sometimes thousands of miles away, under the Trump Administration’s “zero tolerance” policy from April. On June 26 Judge Dana Sabraw ordered the reunion of children under 5 with parents within 14 days, and of all juveniles within 30 days. Of 103 toddlers, 46 were not reunited by the deadline, with the Government claiming that parents were incarcerated, had already been deported, or were a threat to the children. Federal officials said Thursday that another 364 children have now been reunited with parents to comply with Sabraw’s order, but did not explain why the others are still separated. We have been told that families aren’t being separated anymore. Of course there was nobody there but Trump to represent the Americans. Trump was there to receive his orders from his owner. Just look at the photograph and the expressions show the situation. Putin’s face reads ‘you had better say what I told to say or you are in trouble’. Trumps face (nearly in tears) reads ‘I can’t go on like this, I need my mum (albeit there is a false covering expression of pleading to his audience)’. A leader of a country is in the position to cause great damage. Britain has never recovered from Thatcher’s destruction and if America does not soon get rid of Trump they will never recover from his destruction.